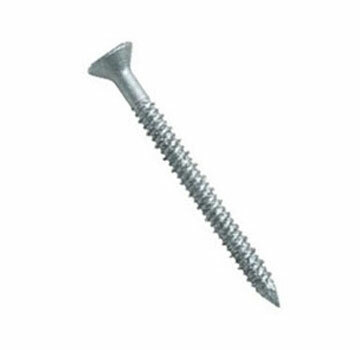 PRODUCT: 1/4" X 2-3/4" CONCRETE TAPPER SCREW ANCHOR, PHILLIPS FLAT HEAD, 410 STAINLESS STEEL. POWERS # 4124. 100/BOX. PRICE/BOX. DESCRIPTION: The TAPPER™ Anchoring System is a family of screw anchors, specially designed drill bits and installation tools designed to meet the needs of most light to medium duty applications in concrete, block and brick. The TAPPER™ concrete screw anchor is produced in either hex washer head or Phillips flat head styles from Perma-Seal™ coated or zinc plated carbon steel and Type 304 stainless steel. For heavy duty applications, the 3/8" size is made in zinc plated carbon steel. Lengths: 1-1/4 up to 6"
Tapper +: For hardened concrete, masonry, pressure treated lumber. ICC-ES tested.